It’s become clear, a week after the launch of No Man’s Sky, that the much-hyped space game has not lived up to many players’ lofty expectations. But whose fault is that? Does it matter? And how could the backlash have been avoided? Critical assessment of the game’s achievements aside—go read Kirk’s excellent review if you want one of those—it’s apparent that No Man’s Sky didn’t deliver on at least a few of the promises made by director Sean Murray and his crew at Hello Games. For years, Murray had declared that in the unlikely scenario that two players ran into one another on a planet, those players would see each other’s avatars. 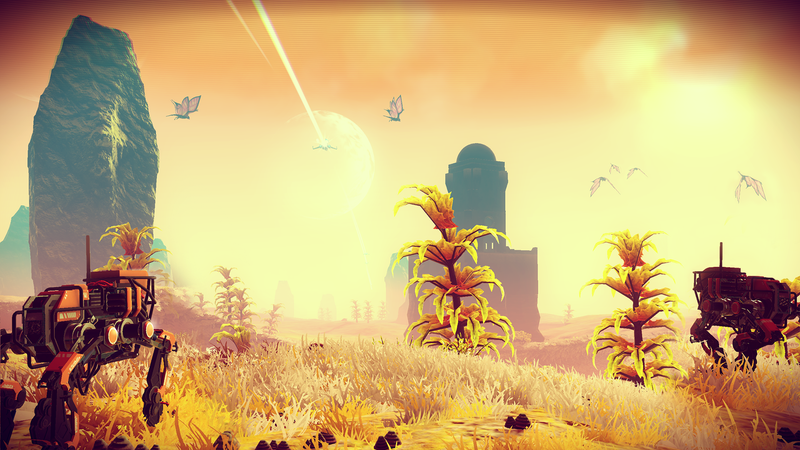 On launch day, No Man’s Sky players immediately found out that wasn’t the case. Murray has not addressed this. He didn’t respond to a request for comment on this story, and the company has not responded to several requests for clarification on this issue. Earlier this week, one Redditor drew a lot of attention with a large, detailed post that compiled a variety of Murray quotes leading up to the game’s launch. “Where’s the No Man’s Sky we were sold on?” the Redditor asked, pointing to various features that never actually made it into the game, from minor (radio chatter) to major (the ability to play the game without gathering resources). The Reddit post is scattered and unnecessarily nitpicky, but the point it makes is hard to ignore. What happened to all of Murray’s claims? It’s not just press quotes—the video footage designed to sell us on No Man’s Sky tells an equally rough story. Early trailers for No Man’s Sky, like the one we saw at E3 2014, appear to show an entirely different game. What’s the deal? Murray and his company haven’t addressed any of these questions, but if I had to guess, the answer is pretty simple: Things changed. Things were cut. Hello Games is a remarkably small team. There are roughly 15 of them. Even after months of sleepless nights and 16-hour work days, they still didn’t have time to finish everything they wanted to get in the game, so those promises were lost along the way. For game developers, it’s easy to sympathize with that. Many took to Twitter to scoff at the Reddit thread. Some called it “entitlement.” One tweet, by game designer Forrest Dowling, drew a fair amount of attention from the game development crowd. “Dev lesson: avoid talking about anything that’s not locked in your game,” Dowling said. “Aspirations become promises once stated.” Other developers chimed in to point out that cases like No Man’s Sky are why big-budget game companies tend to have such controlled PR messages. If PR is running everything, there’s less risk of a game dev making ambitious claims that reflect what they hope to accomplish rather than what they have accomplished. Dowling’s perspective is interesting. He’s been in AAA development, as the lead level designer on the much-hyped BioShock Infinite, and he’s now an independent developer, having just released The Flame in the Flood. So I reached out and asked for more of his thoughts on the subject. It’s easy to see why any game developer would feel for Murray and crew. There’s a sort of fraternity among people who have worked on games—been in the trenches, as they like to say—and making games is a difficult, iterative process that can lead to drastic changes even in the final months of a dev cycle. Game developers know what it feels like to have cool ideas, talk about them, and fail to execute. Yet how do you draw the line between creative excitement and false promises? When a developer makes claims about features in their game, how can video game fans tell if they’re guarantees or just hopes? Many have drawn comparisons between Sean Murray and Peter Molyneux, who infamously promised features that never came to fruition, sometimes telling the media about game mechanics before he even told his staff. Is that fair? Is it false advertising? Taken further, is it fair to say that the developers of No Man’s Sky lied to fans? Over the past few days Kotaku has received a fair number of emails asking us to call attention to that big Reddit post, mostly from fans who feel aggrieved. They feel like they have been lied to. Some feel like they’ve spent $60 on a game that didn’t deliver what its developers said it would. That’s been the frustrating constant. Silence. Since No Man’s Sky shipped, Murray and Hello Games have been silent about these complaints. They’ve been silent about the lack of player interactions. They’ve been silent about the list of missing features. They’ve addressed many of the bugs and crashes, but not much else. It’s that silence that has angered fans more than anything else. I certainly hope the lesson for game developers here isn’t to stay quiet or lean on strict PR-controlled messages for their games. If anything, they should have the opposite takeaway. Have to cut cool features you’ve talked about in the press? Fine! Video games change. We get it. The solution isn’t to stay silent about it, but to explain to fans why they can’t, say, see one another when they’re on the same planet. Or why the No Man’s Sky described in 2014 looks so much different than the one we’re playing in 2016.